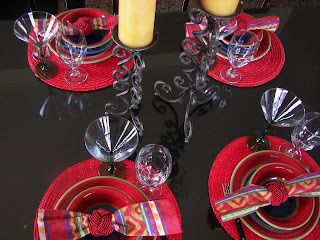 Red Couch Recipes: Let's Mambo Tablesetting! This is the relatively new "Mambo" pattern available at the Dollar Store. You can purchase plates, bowls, and mugs and sadly no dessert or salad plates...sigh. I love the vivid colors; it is available in another pattern scheme with more yellow! The Dollar Store website says "Nothing says caliente more than the bright blue hues of these dishes...." I really DO love these dishes...and what a bargain! I have used them a ton already...they do just say party! The dishes are great with Latin or maybe even Italian or African food. The plates definitely add color to the table. I will share my Chicken Ole recipe, served on these plates, tomorrow for Foodie Friday. 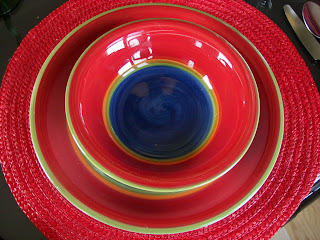 I am participating at Tablescape Thursday with Susan at Between Naps on the Porch. It is a great place for dishaholics. 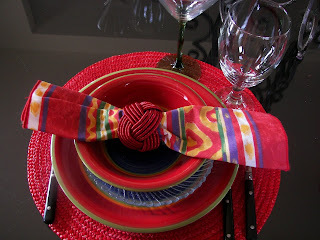 You can access Tablescape Thursday with the button at the end of my posting. I like the bright napkins with these plates...they also say let's party! This is an overhead shot...lucky for me I didn't fall off the chair...highlighting the candles and candlesticks. I love the clear glassware with the bright plate colors. Plates, Bowls, and Green Stemware: Dollar Store -- the last time I was at my Dollar Store all of these were available. Ooo...they are pretty! I love the bright colors. Joni, These are pretty! They are so very colorful! Great job! I look forward to your next post. Enjoyed getting to know you a little better. Nice, bright colors! Love the candle holders! I love your bright red table, it is such a happy color. We love our little orange kitty, too! Very bright, colorful table. Pretty! Great tablescaping. Don't you just love the dollar store!!! Thanks for stopping by and becoming a follower! I am glad you entered my giveaway. I am becoming a follower of yours also, love any blogs about dishaholics! You are one right? I bought these too - but I went with the yellow centers. What a deal! Such color and only a dollar a piece. Haven't figured out the tablescape yet, but it will come. Very cute! I didn't even know they had a website! Love your bright colors! You've put this all together so beautifully too. You just never know what pretties you'll find at the dollar store! Very fun and pretty! I love bold colors on the table. What a happy, fun table. Would your sister make me some of those bright napkins! Happy thursday to you! Such a bright and cheery tablescape. I love the colors. Amazing what you can find at the Dollar Store! Just love it. Oh, so pretty. Your gorgeous table makes me want to have a party with all of those luciously bright colors. Perfect! Muy caliente!!! 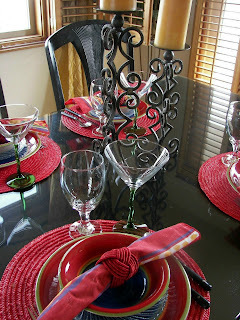 Love the bright cheery colors of your table, and the candle sticks!! 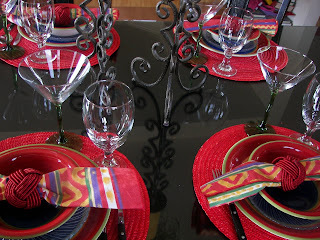 Ooh, this vivid tablescape is awesome!!!! I LOVE the vibrant red!